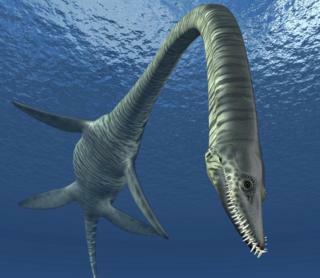 A Jurassic "sea monster" found in Cambridgeshire could prove to be a new species of plesiosaur, scientists said. Oxford archaeologists discovered the 165 million-year-old reptile bones at Must Farm quarry near Whittlesey. Dr Carl Harrington and his team dug up more than 600 pieces of bone as well as the skull, still preserved in clay. "Eve", described as "a fantastic fossil", has anatomical features only before seen in plesiosaurs half her size, a palaeontologist said. Plesiosaurs were sea creatures that lived at the time of the dinosaurs. Eve's "snout" was the first thing Dr Harrington noticed as he was digging around in the wet clay. "It was one of those absolute 'wow' moments. I was the first human to come face-to-face with this reptile," he said. In all, the team from Oxford Clay Working Group dug up hundreds of pieces of fossilised bone and spent more than 400 hours cleaning and repairing the remains. "I'd never seen so much bone in one spot in a quarry," Dr Harrington added. Almost all of the plesiosaur's bones have been found, although the hind flippers and parts of the fore-flippers are still missing. The site of Eve's final resting place - owned by building product manufacturing company Forterra - has given up a number of important finds over the years. Cambridge archaeologists are currently excavating the remains of a Bronze Age settlement described as "Britain's Pompeii" because it is so well-preserved. However, Eve is much older and palaeontologists have reason to think she is a "previously unknown species of plesiosaur". The skeleton is currently being studied by experts at Oxford University's Museum of Natural History. Palaeontologist Dr Roger Benson said although Eve has a long neck, which is not uncommon, she also has "some anatomical features only seen in Picrocleidus, a plesiosaur about half the size of this new skeleton". The Must Farm specimen had an 8ft (2.5m)-long neck, a barrel-shaped body, four flippers and a short tail. Scientists are currently working to remove the skull from inside a block of clay. It has been CT-scanned by the Royal Veterinary College to enable them to accurately locate the bones without damaging them. Eve was donated by Cambridgeshire landowners Forterra to the Oxford museum, who said they were "very excited" to have the new "sea monster" in their collection.